Opened in 1934 the National Science Museum, located at St Patrick’s College, Maynooth, holds one of the largest collections of historic scientific instruments in the Ireland. St. Patrick’s College was founded in 1795 as a catholic seminary in an attempt to stop Irish clerics travelling to revolutionary France for ecclesiastical studies and, it was fear, radicalisation. The campus contains many stunning nineteenth-century buildings, some of which were designed by the famous architect Augustus Pugin. Also located at the entrance to the College is Maynooth Castle which was built in the thirteenth century by the Kildare branch of the Geraldines, who for centuries were one of the most powerful families in Ireland. The museum has multiple displays of various scientific and technological instruments but its central focus is the work of Nicholas Joseph Callan. Born on the 22 December 1799, Callan entered Maynooth College in 1816 and spent most of his life in that institution. It was here that Callan studied natural and experimental philosophy under Dr Cornelius Denvir. Following his ordination in 1823 Callan briefly studied aboard, before returning to Maynooth in 1826 to assume the chair of natural philosophy. Callan performed many experiments and to help in conducting these he was to produce his own, relatively cheap, cast-iron battery, later marketed as the ‘Maynooth Battery’. 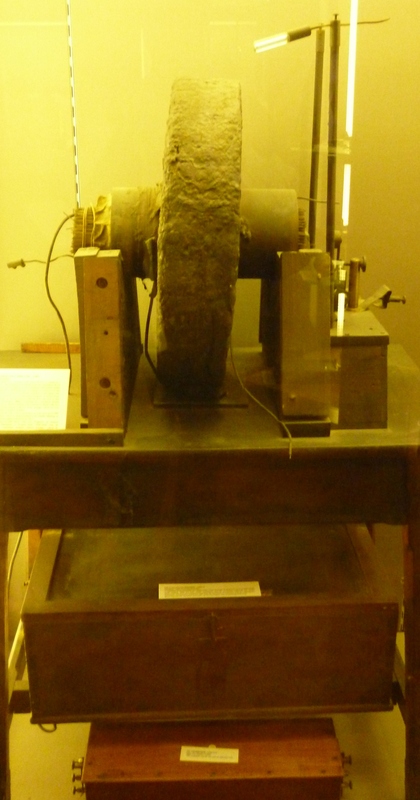 However, Callan is best known as the inventor of the induction coil. The coils built by Callan were of considerable power producing sixteen-inch sparks. As there was no equipment available to test the current produced, Callan instead used that most abundant of natural testing apparatus: his students. According to long established tradition, this was stopped when he managed to render a future arch-bishop of Dublin unconscious and Callan was forced to rely on chickens for testing current from thereon. Callan was for many years a largely forgotten figure however he was recently awarded the Blue Plaque by Institute of Physics and Bronze Plaque by Institute of Electronics and Electrical Engineers. The museum displays several of Callan’s induction coils and electro-magnets. The largest of the electro-magnets on display is 1705cm high and 775 cm in width and was made by the local blacksmith. Alongside these are other instruments used by Callan for his experiments, in addition to a variety of electrical instruments that the museum has accumulated. There is a complementary collection of scientific writings as well in the college archive in the Russell Library, much of which has been catalogued electronically. While the Callan display is the central feature of the museum there is also much more for those with an interest in the history of science and technology. The museum has a collection of historic instruments used for experimentation on light, many of which are of French origin. 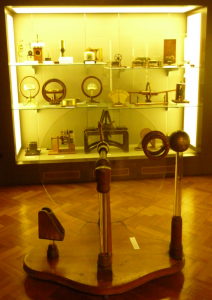 In addition are displays of instruments for the study of meteorology, pneumatics, hydrostatics, heat and a collection of early telegraphic and telephonic apparatus. Worth a special mention is the fine display of cartographic instruments including circumferentors, clinometers, compasses, land chains, levels and other such instruments. These are of particular importance due to the value of estate and ordnance survey mapping records to Irish historians. The display demonstrates the broad range of instruments used in these important endeavours, allowing historians of technology and cartography as well as the general public a rare chance to view such instruments. The fact that a large proportion of the instruments on display were produced in Dublin gives an insight into the thriving scientific instrument industry in the city in the nineteenth century. The collection would be a good starting point for an investigation of this much understudied area and the insight that it could provide into wider scientific and commercial networks. Due to the nature of the founding institute –a Roman Catholic seminary- the museum was originally opened as a museum of ecclesiology, it was due to the appointment of numerous curators from the Departments of Physics and Chemistry and the legacy of Nicholas Callan that the National Science Museum developed alongside the Museum of Ecclesiology. It is for this reason that both museums are contained within the one building. While the National Museum of Science is a relatively small affair when compared to its British counterparts, it is important in an Irish context containing as it does a significant repository of historical scientific instruments that are rarely accessible in Ireland. As 2014 is the sesquicentenary of Nicholas Callan’s death the museum presents a great opportunity to view the work of this important Irish scientist. Charles Mollan and John Upton, The scientific apparatus of Nicholas Callan and other historic instruments (Maynooth, 1994). Marian Lyons (ed. ), Pugin at Maynooth (Maynooth, 2012). Niall McKeith and P.J. Breen, St. Patrick’s College, Maynooth, Museum of Ecclesiology (Maynooth, 1995). P.J. McLaughlin, Nicholas Callan : priest-scientist 1799-1864 (Maynooth, 2000). This entry was posted in Ireland, Uncategorized and tagged ireland, Museums, science and technology museums by Adrian James Kirwan. Bookmark the permalink. Adrian James Kirwan is a Ph.D. candidate at the Department of History, National University of Ireland, Maynooth. His research focuses on the interaction between society and technology. His Ph.D. thesis is a study of the development of telecommunications in nineteenth century Ireland, 1797-1912. He blogs at the history blog Holinshed Revisited.